The glassy surface of a lake with a view of trees hanging down in to an upside-down sky beyond the tip of a canoe is difficult to beat. The green, piney landscape of Maine make for some beautiful getaways. It’s tempting to just throw a pack on and go, but being prepared is key. Decide how basic you want to be on your trip. In Maine you can camp outdoors with nothing more than your tent and a picnic table. If you need a comfortable bed to sleep in and optional room service, book a night in a nearby lodge to stay sane. When you reach for your canoe-friendly clothes, keep fabrics in mind. Take along lightweight choices so that when you do get wet, your clothes can dry quickly out in the sun. Invest in microfiber towels for wet hair and outdoor sandals for walking in water. Maine has a lot to offer, but you will have to pay higher rates based on how much help you get. You can get shuttle services, guides, support – for a price. Visit a few travel company websites and see what kind of trip you want to buy and can afford. Once you’re out on the water, you will see a diverse selection of wildlife. Moose, beavers, deer, and osprey are some of the animals that enjoy these bodies of water as much as we do. Keep a respectful distance as you boat around to stay safe as you appreciate these amazing animals. If this is your first trip, a guide is a great idea. That way you can be sure to see the most beautiful vistas and the most animals possible as you paddle around. Want to know how to catch those Maine lobsters? Get that guide. Escaping civilization is one of the best parts of gliding out on to a river out in Maine. There are some beautiful places to forget yourself and the world. Check out some of these lovely destinations. This river is a nine-day trip that has calm, glassy waters and moments of class I and class II rapids to challenge a canoer. There are some opportunities for hiking up in to the surrounding mountains as well and even up high you won’t see much of the modern world. The name is enough, but this lake also has a soft, sandy bottom and lovely beaches for you to enjoy. You enter the lake by paddling up Lobster Stream, which is also lovely. The lake is shallow, making it better for less-experienced swimmers. The water around this island is famous for lots of different fish as well as beautifully craggy shores. There are also lobsters here as well as tide pools and Acadia National Park on the island itself. The park is one of the most visited in the country. Avoid tourists by veering off towards brownfield bog, a beautiful river that teems with wildlife. 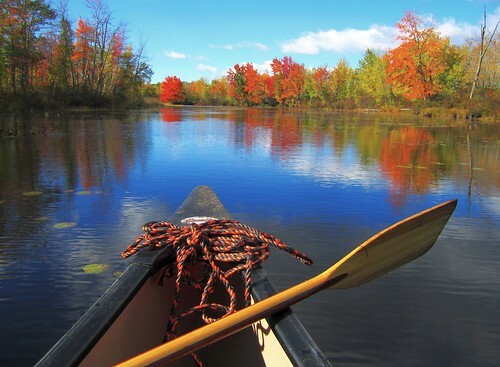 The White Mountains are clearly visible and a trip late in the summer or early in the autumn will dapple the trip with gold and red hues as you paddle along. Any paddler should be ready to pull over and hike as a part of their trip. Maine in particular has some beautiful sights that need to be seen from up high, particularly along the Allagash. Be ready to camp or climb for at least an afternoon if not a whole day. There is also plenty of sea food to be had, so bring your pole or rent one so that you can pull in some salmon or different species that grill up beautifully. Pack a lemon or two to squeeze over the fish or lobster that you have marked for you dinner and you will love Maine. A lot of the rivers and lakes of Maine will take you far from any town or city, which means that you can star-gaze like a pro. Bring along a star guide or a book of Greek myths to fully appreciate the beautiful sights above you at night. Maine is a true gem of the north and is not to be missed. Call your buddy and plan your weekend on the water now. The weather is perfect and the water is fine.